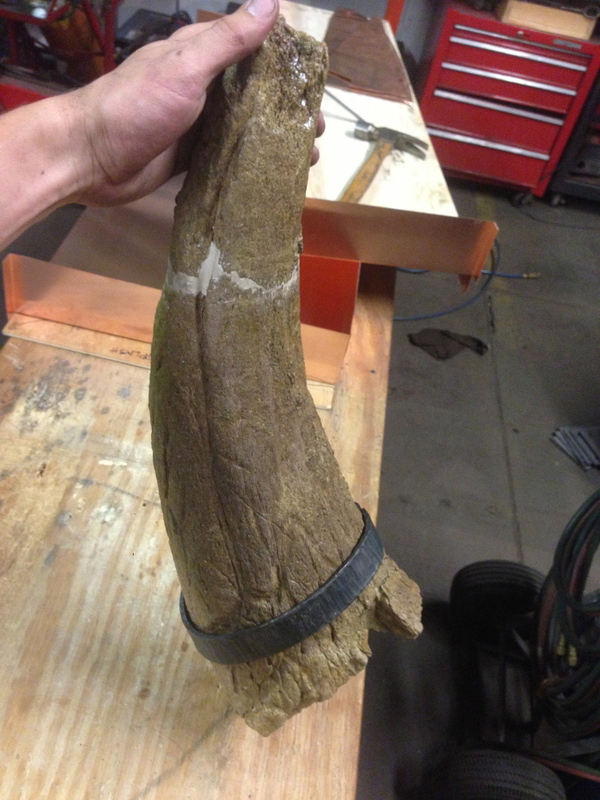 Back in May 2013, a gentleman requested that I make a custom mount for his triceratops horn. Based on my website, he thought it would be ["up my alley"]. It sounded bizarre enough to keep most people attentive, but it just didn't click with me right away. All I had in my head were cartoon dinosaurs and Jurassic Park scenes to distract me from the potential realness of what this guy had, and what he wanted me to do with it. I had to see it to believe it. He turned out to be a nice guy with small business savvy, and taste for the unusual. We hit it off and he was not kidding, this thing was heavy in the hands and full of really old life. I told him it would be at least a month, which wasn't long, but a comfortable amount of time to be able to sit with a subject and vacillate between methods of attachment to in this case; a 35,000,000 year old prehistoric, petrified dinosaur horn! Well, that month has turned into 3 and a half, gladly with his permission. Some things, simply cannot be rushed. I had visions in my head when I took the job on with a month to create. I saw ugly welds, sharp angles and rigid messy haste. I envisioned it in some small town museum, with a hole drilled up into it and a steel rod protruding at an odd angle, welded to a steel plate and shrouded by a hazy plexiglass box. Before I began at all, the beast just got moved around in its original shipping box for two months. But I knew the day would come soon when the project would start to snowball into something crazy. I finally decided, before drawing anything, I would hand forge all of the components and allow the primitive methods of blacksmithing to guide my creative force. I began with the main band that would be wedged onto its tapered shape. One thing led to another most naturally, but in a nice and relaxed manner. After all, this guy was trusting me to create what was commanded by the history and life within this thing. I knew roughly how I wanted the mechanism to function, without putting too much stress or pressure on any point of the fossil. With brainstorming assistance from my very talented part time welder/creator Charlie, we concluded that a spoke configuration would work well to tie the ring to a central hub of sorts. One piece at a time, the components were forged and tweaked and finally welded in place. It was clear that I could not turn back to a more simple approach now that I had carried the baton of quality this far. It was now a matter of time, to carry out the final steps to finish the horn mount. The base ended up being a nice solid 1" thick steel plate that was an end drop from a long 12" wide by 1" thick x 12' long flat bar. I decided to leave the original hot sheared end cut on one side, and texture the other edges to compliment the rest of the forged elements. The bottom forged pipe is attached to a hole in the base plate, which receives a male handle to allow for the piece to be handled by house guests and curious visitors. Who would pass up an opportunity to handle this old world relic?! This opportunity to work with such an original testament to how incredible the world is and once was, has left me with a heightened awareness of my surroundings and an eagerness to incorporate similar rawness into my future artwork.